Two separate law firms, Cauley Geller Bowman & Coates LLP (offices in Florida and Arkansas) and major litigator Milberg Weiss Bernard Hynes & Lerach LLP (a 170-lawyer firm with offices in seven states), have announced a class action lawsuit against VeriSign which provides digital trust services that enable web site owners and others to engage in secure digital commerce and communications. Among other charges, according to the lawsuit, VeriSign engaged in improper barter transactions of dubious quality in order to overstate revenue and assets. What should be troubling to the commercial barter industry regarding this situation, which seems to be growing, is the tainting of barter--a creative and most useful business tool. It's the improper accounting of transactions, be they cash or barter, that's culpable. A manipulated cash deal is not mentioned and painted in the same manner as when the agreement is a reciprocal one. Barter, unfortunately, is once again being portrayed (and seen by the mass market) in a less than favorable light. The litigation focus should be on improper accounting, not about how barter is part of that accounting. It's a bum rap. Israel Rivera, CEO of San Diego based BarterofAmerica.com, affirmed that they are testing a barter debit card. It is internet based, which means each barter client would have to have internet access as well as a swipe card keyboard (for entering the basic account connection information) when using the card. In January 2001 Nordic Barter (NB) and VISA Iceland signed an agreement under which VISA would program Icelandic POS (point-of-sale) terminals to accept the Nordic Barter payment card in much the same way as the generally accepted credit and debit cards in Iceland. This allows NB member companies access to trade credits just as easily as those same clients access their bank account balance. During 2001 the system worked flawlessly with utilization increasing every month. Today over 80% of all transactions within the Icelandic trade exchange of Nordic Barter are handled by the POS system. This has resulted in large savings of manpower within the exchange and eliminates potential human errors when re-entering data from payment slips. The POS system implements and extends widely accepted communication standards, allowing it to be easily adopted to work with terminals anywhere in the world. Currently there are plans to utilize the system in Belgium, with more countries following thereafter. By enabling the electronic processing of barter transactions, Nordic Barter has succeeded in providing customer experience on par with VISA/MasterCard when accessing trade credits stored on an account within their barter system. This has resulted in both increased trade volume and customer satisfaction for NB's members, as well as a greater general acceptance of barter as an alternate way of doing business. The Los Angeles Times front page story Monday, May 6, reported on the thriving secondary currency (called Talento) in Chili and Argentina. Because devaluations have created havoc for the people, they've taken it upon themselves to find a way around the financial crisis. In Argentina there are a million members of the "Barter Solidarity Network." Bernard Lietaer, one of the original architects of the "euro" and the author of The Future of Money, who spoke at the 2000 IRTA convention held in Phoenix, says this type of movement--people in lesser developed countries creating their own currencies for a better life--is exploding around the globe. 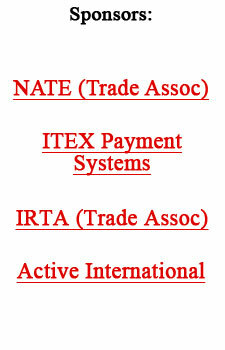 Lietaer was scheduled to speak in Denver at the last IRTA convention. However, due to the Sept. 11 attack and a change in the date, a scheduling conflict made it impossible for him to attend. However, in Phoenix Lietaer expressed the belief that the commercial barter industry had unlimited potential if they took action...for further details on Lietaer's expansive thinking read "Editor's Note's" by clicking ISSUES. Dr. Hazel Henderson, world-renowned futurist, and the author of Beyond Globalization, reports the same findings (growth of currencies around the globe) as Mr. Lietaer. Henderson, in fact, is so convinced of this movement that she is an investor in a new barter company. ManyOneNetworks is projected to be the first global-to-local barter network with no transaction fees. The National Association for the Self-Employed (NASE) says the self-employed are confident about conditions for their businesses in the rebounding economy, believing they are in a strong position to compete with larger corporations today...thanks to technology and a marketplace driven by the need for speed, flexibility and service. Furthermore, seven in ten (69.4%) in the survey of 524 NASE members believed that micro-businesses are in a better, more flexible, position than large corporations to weather challenging economic conditions and trends. When asked to rank people, groups, and events that will have the greatest impact on their business in the next year respondents ranked themselves at the top of the list. Sixty-seven percent ranked "Self" first in the ability to impact their business, followed by "Consumers" at 19%. Only 7% ranked "World Events and Terrorism" as having the most impact on business. Six percent ranked "Representatives of the Federal Government" (Congress, President Bush, and Alan Greenspan) at the top of the list. Our changing world: Mexico's maquiladoras (inaugurated in 1965), a duty-free export assembly program, helped transform a closed economy into the world's 13th-largest exporter, shipping goods worth $76 billion in 2001...almost all to the United States. But a strong peso, a slowdown in the U.S. economy, and the end of duty-free status (to comply with NAFTA) in addition to the evolvement from low-end garments or small-appliance assembly outfits into higher-end manufacturing, sees big change occurring. The result? Some 350 plants are closing leaving 240,000 Mexicans--one-fifth of the industry's work force--out of a job. In short, major corporations are now moving low-end assembly over to China, Vietnam or Guatemala. The International Reciprocal Trade Association (IRTA) held a Global Board Meeting and Strategy Session in Pearl River, New York, April 18 and 19. The group discussed critical changes in the industry agreeing that IRTA's overall vision should not change, nor should its commitment to worldwide membership. The Universal Currency was noted as a major IRTA member benefit, and the UC Board of Governors is moving forward to hire a full-time Trade Broker. The National Association of Trade Exchanges (NATE) is holding its annual convention in New Orleans at the Hampton Inn & Suites May 16, 17 & 18. They, too, feel their BANC currency needs rejuvenation and have plans to find a full-time Trade Broker. Jack Schacht, BANC board member and largest trader within the BANC, explains, "We have to commit ourselves to finding a way to hire a competent broker. Someone whose job will be to promote each exchange's offerings, and help those with higher balances to spend their trade." One-World Business Exchange of New Orleans sent us the following information about the closed Stonebridge Country Club and its 27-hole golf course near Gretna (LA). The extensive property is presently being traded (under a 1031 tax-deferred exchange) for a seven acre piece of real estate next to an interstate highway in Ohio. The value of the respective properties are $2.2 million. The five largest U.S. airlines--United, American, Delta, Northwest, Continental--are the owners of online travel web site Orbitz. There's concern now that the lower prices on Orbitz could undercut rivals and put them out of business, which would boost ticket prices in the long run, critics contend. For now, the consumers are benefiting. Other looks at new technology: KLM Royal Dutch Airlines is introducing new self-service ticket kiosks to speed up airport check-in, even for international flights as the new technology can read passports. If you've missed any of our weekly Tuesday Reports the past two years we have an archive of past issues for you at the bottom of this week's letter....check it out! All the pertinent information, related to the property or ownership, needed to complete an exchange. A slang term describing inventory groupings or classifications. "A-bag" means good stuff, "B-bag" is medium to OK stuff, while only junk is left in the "C-bag."